As I was contemplating getting to work on this week’s blog post and pondering what lead sentence might catch appropriate attention, an old Sunday School song from my long-ago childhood came to mind. I haven’t thought about this musical ditty in decades, but something about the dark political climate in our country these days juxtaposed against the willing workers in our congregation who reach out to help conjured up the memory. Despite the archaic language, I think my young Sunday school classmates and I got the message, which was lived out in our congregation by members of our cheer-up group who routinely took small gifts and plants and edible goodies to those who needed emotional or physical support both in our congregation and in the congregation’s neighborhood, sometimes extending beyond our own membership. Whether it be packing up Christmas bundles for refugee families in post-World War II Europe or singing carols with the MYF for neighborhood shut-ins at Christmas, I’ve never forgotten those gracious, merciful acts of kindness my childhood congregation showed to those in need. Last week I had the privilege of meeting the Ahuatl family of eight. With extensive indoor and outdoor work, they have brought back to life the house at 1326 N. Kaley, hoping to move in this past Friday. KRMC Immigration Ministry representative Marisa (who serves on the committee with Mabel, Janine, and Jenny) met me at the Ahuatl home to translate. Marisa became acquainted with several of the children on the job at El Campito, one of South Bend’s oldest non-profit child development centers, founded in 1970 to help migrant families adjust to their new lives in South Bend. Mabel learned to know several of the children through her work at Kennedy Primary Academy in South Bend. Since the two Immigration Ministry members were both aware that the family hoped to buy their first house after being in a two-bedroom rental home for eight years, the committee came up with ways they could support the family’s efforts. About a year ago, the Immigration Ministry committee gave a scholarship to one of the children to continue pre-school. Last October Kern Road, under leadership of the Immigration Ministry group, provided labor and supplies for a painting workday at the house. Around Christmas, the committee funded tub and shower installation during renovations. The family purchased the home through a realty company for $6,000 without knowing that the city of South Bend already had slated the structure for demolition. After paying $500 to rescind the demolition order, the family eventually secured a grant to help defray costs of installing new windows, plumbing, gas, siding, and water. 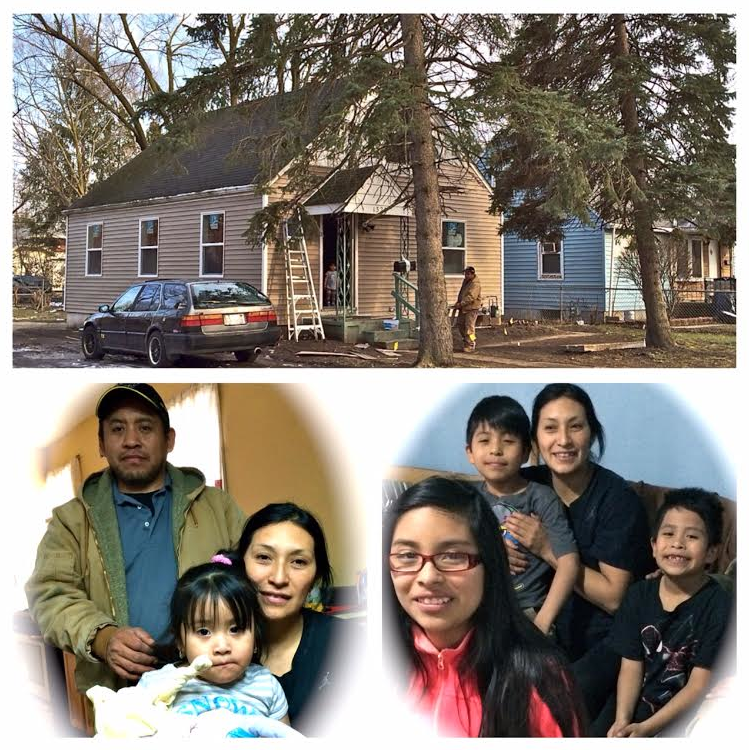 Mom Piedad had been working at home until recently, but when her youngest child went to daycare in September, she took a part-time job to help with expenses of restoring their home while continuing to pay for their rental house. Both Piedad and her husband Librado are employed by a University Park Mall restaurant; Librado also works a second seasonal job maintaining the grounds at the South Bend Country Club. In February of 2003, Librado came from the state of Puebla, Mexico, to South Bend, where members of his family had settled prior to his arrival. He was in town eight years before he went back to Mexico to bring Piedad to South Bend. Oldest child Ana is 12 and a middle school student at Dickinson. Her three brothers Agustin, 10, Edgar, 8, and Kevin, 7, are students at Kennedy. Five-year-old Bryan is enrolled in preschool at El Campito, along with Alison, 3, recipient of a current KRMC scholarship. Neighbors have appeared to greet the family with a doll for the three-year-old and bikes for some of the other children. Family friends live a couple of blocks away, and the Immigration Ministry committee is considering ways Kern Road might help welcome the family, perhaps with a house blessing after they are settled in or with assistance to install a fence around the back yard this spring or summer. Once warm weather arrives, those of us who live in or near the Near Northwest Neighborhood might consider walking or biking by to say hello. Even if you don't live near the Ahuatl family, reflect on how you might "brighten the corner where you are" as we continue during this Lenten season to listen to and learn from the living stories Jesus told his disciples. And many thanks to this family for brightening their corner of South Bend!